devyn | Sophisticated Diva ~ A.K.A. Along came Polly! 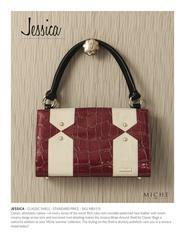 Welcome to the new July 2011 MIche bag shells! Jessica, standard classic Miche bag shell is rich red with white trim, and would look gorgeous with the cream handles as well as the original black handles. Tammy is a premium classic shell, brown with a woven pattern-and will compliment the brown base as well as your black base, and looks lovely with the long brown or brown chain handles. 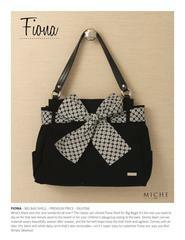 Fiona–a beautiful black canvas shell with a black and white bow for the Miche big bag! 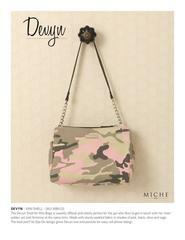 Last but not least is Devyn, a pink camouflage pattern in a wrap around style for the Mini Miche bag! 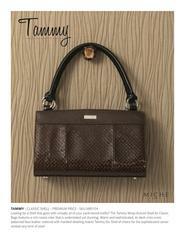 Visit me today on FACEBOOK to stay tuned in for all Miche bag new releases. Local pickup available, delivery USPS mail throughout the US.